I want to introduce the judges and all of Subiefest to my Outback I named Frankenstein. It's dented, dinged, scratched up, been in a few accidents (non mine lol). Been taken apart and put back together with parts and panels from multiple Outbacks, Legacies, and Foresters. She even used to be green hence Frankenstein. But I recently painted the whole rig with bedliner black textured finished. I built the engine out if necessity using parts around the garage. My custom engine code now is, EJ22325D. The Block from a EJ223 and the heads and intake from the EJ25D that came with the car. I'm now running 10.6:1 compression. I'm also running a dodge neon coil for a fatter spark and wrx spark plugs for the change in compression. I also have UEL Amazon Headers with a High Flow Cat and Stromung Axleback Exhaust. 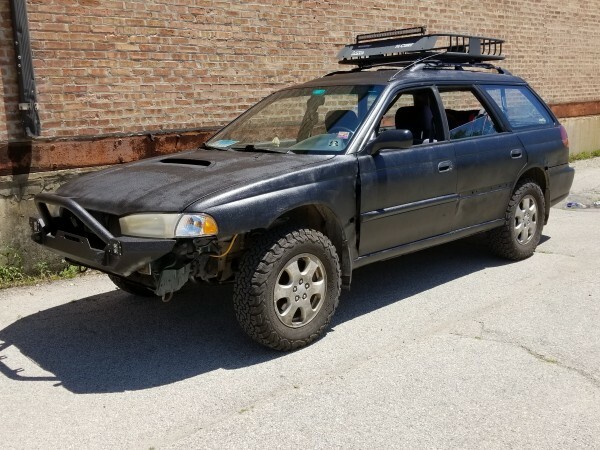 For suspension I'm running 1998 Forester struts and springs with 2.5" strut top spacers and BFGoodrich Baja Champion All Terrain T/A K/O2 Tires 215 75 15. With the tires its 4.5" over stock. All that's left is my cargo roof box with light bar, and my Jeep TJ front bumper with LED Fog Lights, front and rear D-Ring shackles and trailer hitch. Ladies and Gents come check out Frankenstein!